A new spirit created by a team out of Philadelphia is drumming up some big buzz. 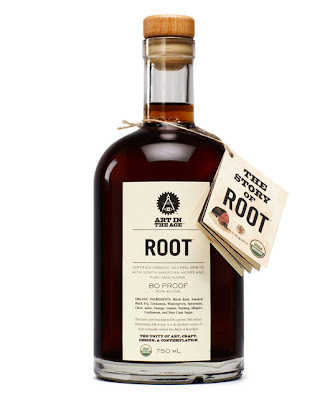 Root, an organic 80 proof liqueur that aspires to resurrect root beer's colonial predecessor root tea, has already gotten ink in Vanity Fair and Gourmet (RIP). And hey, I flow with the trends, so now I wanna try some. And it reportedly plays well with others. Cocktail recipes on the site include a Root de Pina, the Royal Apple with whisky and a spin on a hot toddy. The first batch has been released in "highly limited quantities" in and around Philly. I have yet to spot it in DC, so while we wait, you can order it online (details here). Meanwhile, might this buzzworthy newcomer spark a root beer revival in craft cocktails? I tasted one contender just last week at the new Sou'Wester in the Mandarin Oriental. Sommelier and mixologist Carlton McCoy is making his own root beer for a cocktail float featuring Jack Daniel's, vanilla bean, Angostura bitters and soda. Try it out during the restaurant's Country Time happy hour, daily from 3-5 p.m., when cocktails are $7 instead of $10. And let me know if you spot any Root out there. What do you mean? People with real jobs can't just up and leave for cocktails at 3pm?! That's all it took? Product placement by the Lizzie Grubman of spirits and BAM, you want some? Publicists and other assorted hired flacks must loooove you! Dan has some up at Room 11...be nice and he'll serve up some. Anon #2 - Yeah, those "product placements" in Gourmet and Vanity Fair really hooked me. For the record, I've never been in contact with anyone from Root, not that it should matter, because it sounds like a cool new spirit I'd love to try. Sounds like you have an ax to grind. Josh - I heart Room 11. Thanks for the tip. Did you try it? Hey, I wanted to try it too after seeing it in Vanity Fair. It sounds yummy! How else am I supposed to find out about stuff like this? If it's not in the bars around here yet and not being sold in local stores? Maybe some people get new liquor news beamed to them while they sleep - the rest of us have to read about it somewhere. Liked this article - I'd heard of this but haven't seen it on DC menus yet. I wonder if Ace carries it. Distribution is only in Pa right now, but other states and DC should come soon. And you can get it online. After seeing Root featured in Garden and Gun several months ago, I drove straight to Philly and bought a bottle. It's absolutely delicious, well worth the two hour drive. It's not too sweet (I was worried it might be cloying), the flavors are very detailed, and it's wonderful served neat. We didn't try any cocktails with it - the bottle was gone too quickly. However, I find it so delightful I will likely drive to Philly before the holidays and buy an entire case! Going to Philly next weekend. I know what "souvenir" I'll be bringing home... Thanks for the report, Meg!